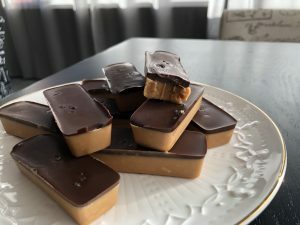 This is a recipe that I made for people who want to have a treat that is easy to make at home, not too crazy in the ingredient list and for people who just need a crazy amount of calories per day. If you are a weight lifter, athlete, or just a person who has a very physically intensive job then these are great because they pack a lot of calories for a their size and having a few of these a day can help you get your daily energy without having to consume a huge amount of volume during your meals. These are also low in sugar, so you don’t have to worry about spiking your insulin if you want to supplement these into your day. In a medium bowl combine the peanut butter, coconut oil and maple syrup. Microwave for 40 seconds or until the mixture looks melted. Add the vanilla and mix with your spatula until ingredients are really well combined. Pour or spoon your peanut butter mixture into your mold (have your mold on a tray to make transferring to freezer easy). Fill each cavity about 3/4 of the way, depending on the size of your mold, you may need to use one more. Place in the freezer for 30 minutes or until firm to the touch. Once they have become solid, pop them out of the mold and store them in an airtight container in the freezer or fridge. They keep in the freezer for up to 2 months and in the fridge for up to 2 weeks. You can use almond butter instead of peanut butter. If you like you can sprinkle the chocolate layer with additional nuts, seeds, or coconut while it’s still soft. You can make these in paper cupcake liners if you don’t have silicon.